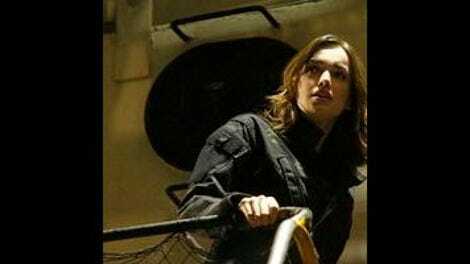 After two episodes appearing as a hallucination in Fitz’s mind, Jemma Simmons makes her proper return to Agents Of S.H.I.E.L.D. with one of the best sequences this show has ever executed. The breezy montage of Simmons’ morning routine has a lot more personality than the usual S.H.I.E.L.D. scene, largely because of the cheery music choice of “God Help The Girl” by Belle and Sebastian front man Stuart Murdoch. This show doesn’t spend much time with these characters in domestic environments being themselves, and going through Simmons’ morning ritual creates an immediate sense of familiarity between the viewer and the returning character. The scene also introduces a refreshing lightness after a cold open of supervillain monologuing and secret agent brainwashing, shifting to a bright, optimistic tone until the reveal of Simmons’ new employer darkens the mood again. The reason Simmons isn’t with Fitz anymore is because she’s an undercover agent gathering intel for Coulson by posing as a scientist for Hydra, a plot twist that injects a heavy dose of early Alias into the series. The musical cue in that first Simmons scene has a J.J. Abrams-like cheekiness, and the double agent angle adds a layer of tension that makes this episode far more intriguing than the last two. Simmons has been working for Hydra long enough to be chummy with the security guard working the downstairs check-in, but she hasn’t obtained a position that gets Coulson any particularly valuable information. That changes when Donny Gill (the boy with ice powers from last season’s “Seeds”) enters the picture, and Simmons’ past relationship with the young man makes her an asset to Hydra. The high stakes of Simmons’ deeper involvement are set by the scenes showing Daniel Whitehall brainwashing a S.H.I.E.L.D. agent that refuses to be loyal to Hydra; that agent will ultimately become Whitehall’s servant, and that could be Simmons’ fate if she’s not careful. Putting Simmons in enemy territory gives writer Monica Owusu-Breen the opportunity to show how the bad guys operate from the perspective of someone rising through the ranks, and splitting up Fitz and Simmons is the best plan of action to make them stand out as individual characters. With real Simmons getting so much screen time, Fitz’s fake Simmons is downplayed this week, a wise decision that allows Fitz to have some serious character development on his own. Fitz is paranoid that his teammates are keeping secrets from him, so he does some investigating that leads to the last person he wants to see: Ward. When Fitz’s hallucination of Simmons tries to stop him from entering the vault where Ward is kept prisoner, Fitz is able to expel the vision by admitting that it’s not real, leaving him to face a horrifying chapter of his past without the imaginary support of his best friend. Fitz breaks down when he sees his former teammate, and without Simmons there to keep him in check, Fitz takes drastic measures to make Ward suffer by depriving him of oxygen. It’s a vengeful moment that reveals how far Fitz has deviated from his old personality following his acute mental trauma, and Iain De Caestecker does strong work capturing the character’s spiteful rage in that moment. To make up for his absence last week, Ward shows up in three whole scenes in “Making Friends And Influencing People,” serving as a Hydra exposition machine and agitator to both Fitz and Skye. It’s nice to see this series committing to the core cast again after getting sidetracked by new characters in this season’s first two chapters, and in addition to the primary action surrounding Simmons and Fitz, Skye also gets considerable attention this week. In a storyline sponsored by Fitbit, Skye learns what it’s like to kill a person for the first time, and it’s not a particularly uplifting feeling. While dealing with the trauma of her first kill, Skye gets dealt another blow when she visits Ward to ask him if he was brainwashed into working with Hydra. Because he’s an honest man now, Ward admits that he was in full control of his actions, then drops a major bombshell: Skye’s father is alive, and he can take her to him. You know this is a huge moment for Skye because her Fitbit shows that her heart rate is rapidly increasing, and I have to give Owusu-Breen credit for going out of her way to integrate the product placement directly into the narrative. Owusu-Breen’s script makes some strained connections between Simmons and Donny’s difficulty making friends, but a few forced thematic ties are totally acceptable when the rest of the plot is such an improvement. 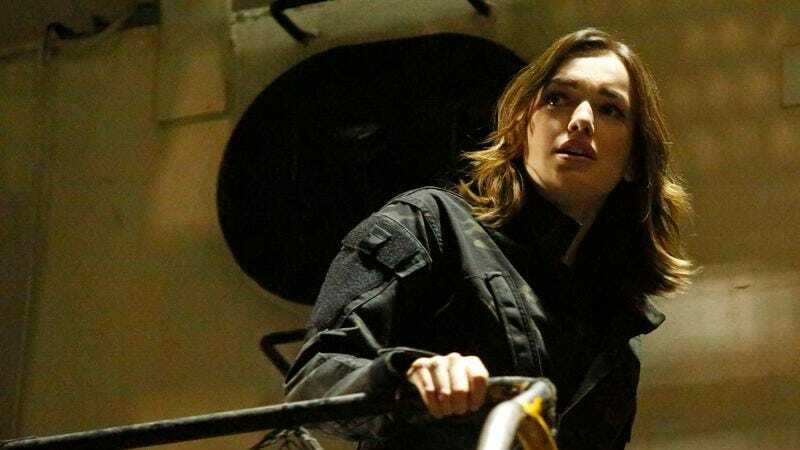 By the end of the episode, Skye knows about her father and Simmons is firmly entrenched in Hydra, two storylines that give the series the kind of forward momentum it should have had after the season premiere. “Making Friends And Influencing People” provides a strong idea of how the conflict between S.H.I.E.L.D. and Hydra will play out moving forward as both agencies try to obtain “gifted” assets, and putting Simmons behind enemy lines highlight the espionage element that is often overshadowed by this show’s emphasis on action. The most important thing about this episode, though, is that first Simmons scene. By making a bold stylistic choice, the show immediately makes Simmons’ thread the most interesting part of the narrative, and more sequences like that one could help Agents Of S.H.I.E.L.D. break out of its generic aesthetic. The Middle Eastern music that plays when the action first transitions to Morocco is another Alias-y touch, and I would love to see the show’s score reinforce the setting more often. Right now the music conveys specific emotions and attempts to bring big-screen bravado to the action, but it can easily be used as a tool to help flesh out the environments by using sounds unique to whatever region the S.H.I.E.L.D. agents travel to. Agent May still doesn’t have very much to do, but the future looks bright for her judging by the preview for next week’s episode, which shows May and Coulson dressed to the nines to infiltrate some sort of fancy party. That should be fun. Is it just me or has Coulson gotten sexier this year? He looks very suave when he meets with Simmons. They also seem kind of flirty. How old is Donny Gill supposed to be? Because he looks like he’s barely an adult. What are we thinking about for Lance Hunter nicknames? Britty McBiceps?